Over the years, I’ve seen Mercury, Venus, Mars, Jupiter and Saturn with my naked eyes. And I’ve seen Uranus and Neptune through a telescope. 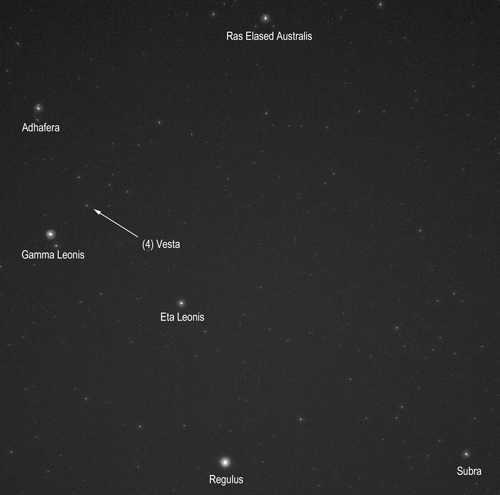 But I’ve never seen an asteroid until last night, when I photographed the 2nd largest minor planet, Vesta. Vesta is currently near opposition, meaning as seen from the Earth, Vesta and the Sun are 180 degrees apart. This makes Vesta well-placed for observation all-night long, and also means that it is around as bright as it ever gets. So if you are eager to see an asteroid, give it a try some clear night in February or March. The first step is to find the constellation Leo. Where exactly Leo is from your location will depend on your latitude. But generally, if you are in mid-northern latitudes, a good start is to look to the south-east around 10pm. If you are running Linux, give KStars a try to simulate what the sky will look like. Once you’ve found where Leo is, take a look at this chart showing the location of Vesta [PDF] over the next few months. 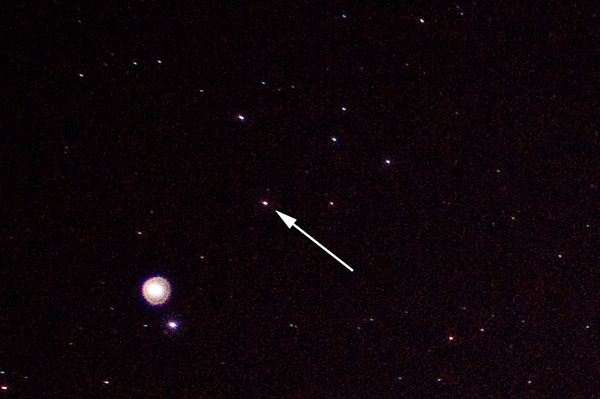 Since Vesta is now around magnitude 6.8, it is too faint to see with the naked eye. But it should be visible with even the smallest telescope or binoculars. Compare what you see with the chart. Don’t expect to see any disk or features. It will look just like a star. If you want to be sure, make a sketch of the location of the stars you see in the area, and compare it a night or two later. If it is Vesta, you should see it noticeably move from night to night. Instead of using binoculars or a telescope, I decided to photograph Vesta. With some trial and error I found a technique that worked rather well. Obviously, you need a camera that can record the faint stars without so much noise that it overwhelms them. I don’t think a little compact digital camera will work well here. It is all about light gathering ability of the lens. The little lenses in a compact camera will not work well here. But a DSLR can work well, especially if you have a fast lens. Use the fastest (lowest f-ratio) that you have. If the lens is too “soft” at its wide open setting, you can also try stopping it down a stop. The focal length of the lens is not that important. A big telephoto lens is not going to help here. You are not going to be able to make Vesta look any bigger than just a pin point of light. At the other extreme, if you use a wide-angle lens, your image scale might not allow you to resolve individual stars well. You want something in the “normal” range, not telephoto, not wide angle. You will need to take a longer exposure, several seconds long, so a tripod is a must, to hold the camera steady. You also want to use a cable release or remote trigger to avoid camera shake. If you know how to set the mirror-up lock on your camera, that can help as well. You want to take as long of an exposure as you can while avoiding the star images streaking (from the earth’s rotation). This will depend on the local length of your lens and the resolution of your camera. Try exposures in the range of 2-30 seconds. You will want to set the ISO speed as high as you can without the noise level getting too high. What is too high? Use your judgment. At some point the noise overwhelms the star images. If you are in a suburban location, you may find that the light pollution causes the image to “fog up”. If so, reduce the ISO speed or decrease the exposure. In my case, I used a Pentax K20D at ISO 800 with a 50mm f/1.4 lens and a 4-second exposure. The results are as above, which I’ve annotated, as well as a the blown up details When I compared to the chart the extra “star” was obvious. It doesn’t look like much, but that is Vesta, nearly 600km in diameter, orbiting somewhere between the orbits of Mars and Jupiter.